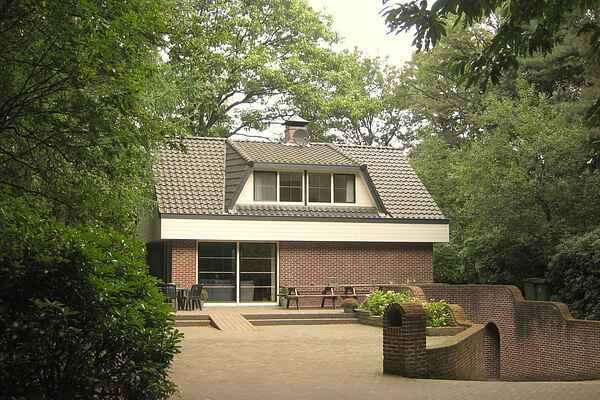 This detached holiday house is in a pretty location in the middle of Lunteren forest in the province of Gueldre. The wooded grounds (8,800 m²) are fully enclosed and therefore perfectly suitable for children to play in. The various facilities (swimming pool, sauna and sun bed) combine to make your stay in this house perfect. A must for a pleasant family holiday or a holiday with friends. Additional information: - The holiday house has sleeping space for sixteen people but for preference it should be rented to a maximum of fourteen adults (due to restricted space in the living area). - Bath linen consists of 4 hand towels and a bathrobe. - On your arrival you are given 14 tokens free of charge for using the sauna, sun bed, steam shower and jet-stream in the swimming pool. You can buy additional tokens on-site. - All the beds in the house can be adjusted electrically.